Part of being a responsible backyard birder means keeping bird feeders clean and in good condition. Even the most conscientious backyard birders can be stumped, however, by how to clean the scattered debris, seed hulls, feces and other messes that accumulate under busy feeders. If left unchecked, this mess can be unsightly, may smell and can be hazardous to birds, but there are ways to keep the ground underneath feeders fresh and clean. The wasted seed that is less likely to be eaten and will spoil more quickly on the ground. Damage to grass and plants, as well as disrupting the soil's chemical and pH balance. Growing mold or mildew and spreading diseases to birds that feed on the ground. Strong odors of rancid, rotting seeds, spilled suet, spoiled nectar or other debris. Sprouting into unwanted weeds and excess plants in your yard. Attracting mice, rats, raccoons and other unwanted wildlife or pests. Attracting large flocks of the least desirable backyard birds, including bullies such as rock pigeons, common grackles or European starlings. Regularly cleaning beneath bird feeders can eliminate these problems, however, and backyard birders can continue to enjoy the flocks at their feeders without the hassle of an unattractive feeding area. Here are several ways to clean under feeders. While each method will not necessarily be effective in every yard, the best way to keep the ground clean is to use as many techniques as possible. Rake the ground to loosen hulls and debris, then use an outdoor shop vacuum or leaf vacuum to collect the material and dispose of it properly. Move feeders to a new position in the yard each month, rotating positions so each prior location can naturally decompose before it is used again. Add a 3-4-inch layer of mulch below the feeders, then turn the mulch to bury debris where it can decompose out of sight. Replace the mulch seasonally to dispose of remaining debris. Allow feeders to remain empty for a day or two to encourage birds to pick up spilled seed and be their own cleanup crew. Trim grass around the feeder shorter than the rest of the lawn so the debris can be cleaned up more easily, and mow around the feeding area with a collector bag for easy disposal. Allow squirrels and chipmunks to feed below the feeders rather than discouraging them, but use baffles and other techniques to squirrel-proof feeders, so they do not spill more seed. Consider using natural enzyme sprays (available in garden centers) to promote faster decomposition. Always read safety warning labels carefully when using sprays around children and pets, and be sure sprays are safe to use on other plants in the yard. It may be impossible to clean up every individual seed hull or spilled piece of seed. By methodically using different cleaning techniques, however, it is possible to keep the ground under bird feeders safe, healthy and attractive. 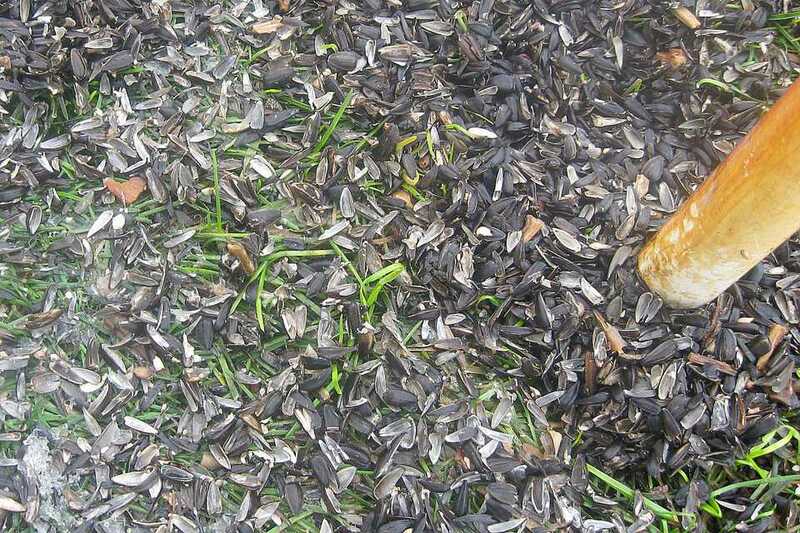 The easiest way to clean up under feeders is to keep seed from spilling in the first place. Position feeders on or above a concrete, stone or wooden deck or patio, so the seed does not become embedded in the grass or flowerbeds. Regular sweeping or vacuuming can clean up any spillage much easier than from grass. Add wide seed trays, nets or platforms below feeders to catch anything that drops from the feeders. This will also provide another space for birds to feed, which will help minimize any remaining debris or waste and will attract new birds to the feeding area. Offer only enough seed for a single day's feeding to encourage birds to eat the entire helping rather than tossing out excess seed to get the best tidbits. This can also conserve seed to help a budget without eliminating feeding altogether. Switch to no-waste bird foods such as hulled sunflower seeds, nut hearts, suet, nectar, fruit and other foods birds will eat completely, without any hulls, husks, shells or other waste to discard. This can be more expensive at first but is worth the extra cost because there is no payment for inedible debris, and no work to keep the feeding area clean. It can be hard to keep the area under bird feeders clean and fresh, but doing so is essential to keep a yard healthy and safeguard backyard birds from diseases. With a few careful steps, spillage and waste can be minimized, and the yard will look much better and be much safer for every bird that visits the feeders.